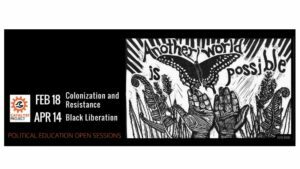 Join us for the first Open Session* of the 2018 Anne Braden Anti-Racist Training Program! Puerto Rico. Palestine. Oakland and Berkeley. Three visionary community leaders will speak with us about the ongoing colonization of these places, and the politics and strategies of indigenous resistance. Come learn about how we can stand with these powerful liberation movements. We are particularly excited to be flying in Alicia Rodríguez, a former political prisoner who has been part of the Puerto Rican independence movement for the last 40 years. She will join local movement leaders Corrina Gould, currently leading the fight to save the West Berkeley Shellmound and return sacred land to native stewardship, and Lara Kiswani, Director of the Arab Resource and Organizing Center. Sliding scale donation of $0-$15 suggested. This event is fully wheelchair accessible including bathrooms. Please email us at accessibility@collectiveliberation.org by Tuesday, Feb 13th, to request ASL interpretation, language translation, or with other access needs. This will be a reduced-scent space and there will be fragrance-free seating area. Please join us in ensuring accessibility for beloved community members with chemical injuries and chronic illness by not bringing fragrances or scents on your clothes, hair, or skin from colognes and perfumes, scented laundry detergent, hair and body products, “natural” products, and essential oils. Please prepare in advance by not using products with fragrance, or by using fragrance-free, non-toxic products. For more info on what this means, visit here. Corrina Gould is the spokesperson for the Confederated Villages of Lisjan/Ohlone. She is an acclaimed speaker locally, nationally and internationally on the work of sacred sites protection and preservation, as well as the invisibility of her people. She was born and raised in Oakland, CA, the territory of Huichuin. She is the Co-Founder and a Lead Organizer for Indian People Organizing for Change, a Native run grassroots organization that works on Indigenous people issues. In 2011 Corrina, Johnella LaRose, Wounded Knee De Ocampo and a committee of others, joined together and put a call out to warriors to create a prayerful vigil and occupation of Sogorea Te in Vallejo CA, an occupation that lasted for 109 days and set precedence for future struggles to protect sacred sites. Her current work includes the Co-Founding of a Native women led urban land trust, the Sogorea Te Land Trust. Alicia Rodríguez is a Puerto Rican independence fighter who spent 19 years as a political prisoner. She was born in Chicago in 1953. Living in the U.S. did not protect her from racism and poverty. In the early 1970s, her first trip to Puerto Rico was a turning point in her life. She witnessed the devastating effects of industrial pollution and resolved to join the anti-colonial struggle. In 1980, Alicia and ten other compañeras and compañeros were arrested and convicted of seditious conspiracy, the act of attempting to overthrow the government of the United States in Puerto Rico. She was sentenced to 85 years in prison. Alicia and other Puerto Rican political prisoners were released from prison on September 10, 1999, after a victorious campaign of solidarity forcing President Bill Clinton to grant clemency but with conditions. She lives in Puerto Rico. She has taught pottery making workshops in different cities in the United States and in Puerto Rico. Before the Puerto Rican economic crisis and Hurricane María’s destruction, Alicia taught clay classes in the town where she lives. Lara Kiswani is a Palestinian born in the Bay Area. She got her Masters in Education with an emphasis on equity and social justice where her work focused on Arab youth, language and culture. As a student organizer, she helped to establish the Middle East South Asia Studies program, cofounded Students for Justice in Palestine and organized with Third World Forum at UC Davis. She has worked as a youth and adult educator, and is currently a member of Al-Juthoor of the Arab Shatat, a local Palestinian folkloric dance troupe, is a lecturer at San Francisco State University in the College of Ethnic Studies, and the executive director of the the Arab Resource and Organizing Center (AROC). *The Anne Braden program is an intensive organizing training to develop white anti-racist leadership to build support for racial justice and help build powerful multiracial movements for collective liberation. 50 activists from all over the country are coming to Oakland to participate in the 2018 training. Open sessions provide an opportunity for all members of the community to dig into these political questions with us.